Classical: If you were an Olympian god, what would you be known for? Like Artemis and Diana, I'd be known for my love of animals. Gothic: What is your favorite historic building? Oh, I love so many old buildings! 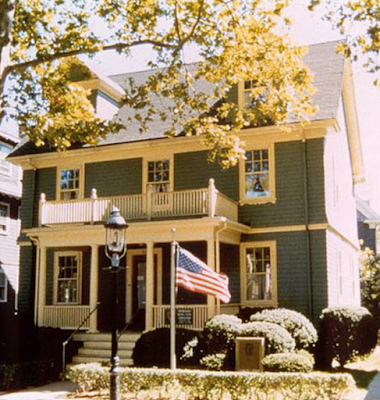 Since you're asking me for one, I'll go with JFK's birthplace in Brookline. 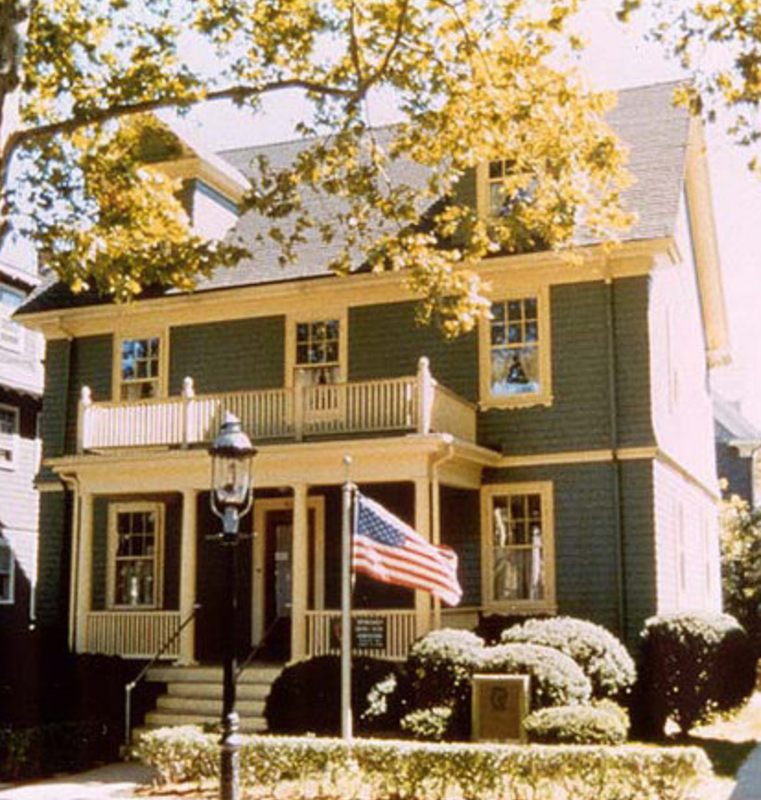 This is where history was shaped -- the defining sibling relationships among Joe, Jack, Rosemary and Kathleen ... where Kennedy first picked up a book and fell in love with words and reading (if you visit, you'll see his well-worn copy of Billy Whiskers) ... the surprisingly small backyard where he learned to ride a bike ... I visited only once, more than a decade ago, but it's stayed in my heart. 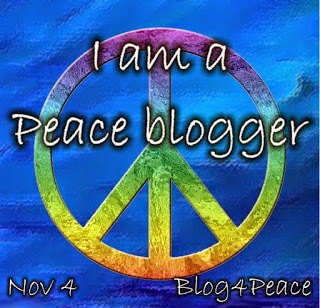 Renaissance: Have you ever had a time in your life when you felt enlightened or changed? So many times! But, since an earlier question got me thinking about faith I'll go back to a sad Saturday night in the early 1990s. I had just ended a relationship with a man I loved very much. I was desolate, and that night felt like the longest one of my life. Sunday morning dawned and I went to church. Singing hymns as the sunlight streamed into that sacred place was a balm to my heart. I made the decision that morning to join the congregation. I wanted to formally show my respect and gratitude to the Lord for helping me heal. Baroque: Do you enjoy the finer things in life? Not really. A typical refrain of my youth was my father admonishing me for not showing proper respect for my stuff: "This is why the Gal can't have nice things." Rococo: Is your bedroom full or trinkets and pictures? If so, which pictures adorn your walls? I love this poster of Marilyn in Malibu, 1948. 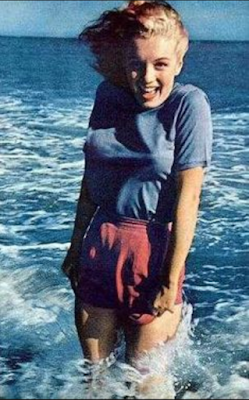 At the very start of her transition from model to actress. Doesn't she look happy? I respond to the uninhibited joy, and it reminds me to be careful what I wish for, because I just might get it. Neoclassicism: If something came back into fashion, what do you hope it would be? I liked the big, satchel handbags of the 1970s. Let's see those come back. Romanticism: Do you often see things in a positive light? I try. Not always successfully. by Sandi Ward. It's the tale of a family in distress as told by their confused cat. 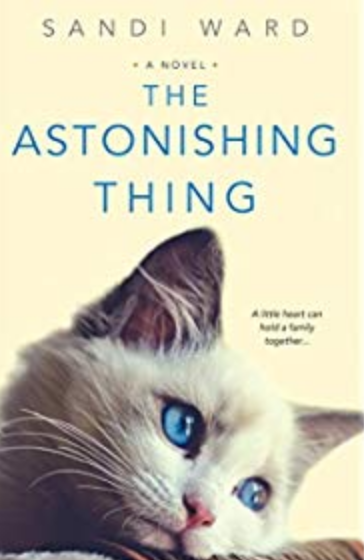 It's a moving and life-affirming story and I'd love it to reach a wider audience. Impressionism: Do you look for details or take everything in at once? I get an impression, and then I drill down. Art Nouveau: When were you last at the theatre? I saw The Old Man and The Gun back in October. Surrealism: Why does the porcupine think it's a duck? Because it's quacking up. 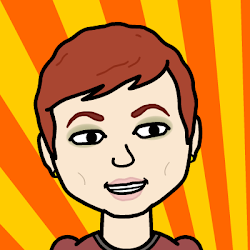 Pop Art: Do you enjoy pop culture? Yes. Contemporary: What did you do today? It's still morning, so not much yet. Presidents Bush and Clinton had an unlikely but authentic friendship. Barbara Bush said she thought her husband was Bill's "surrogate father." 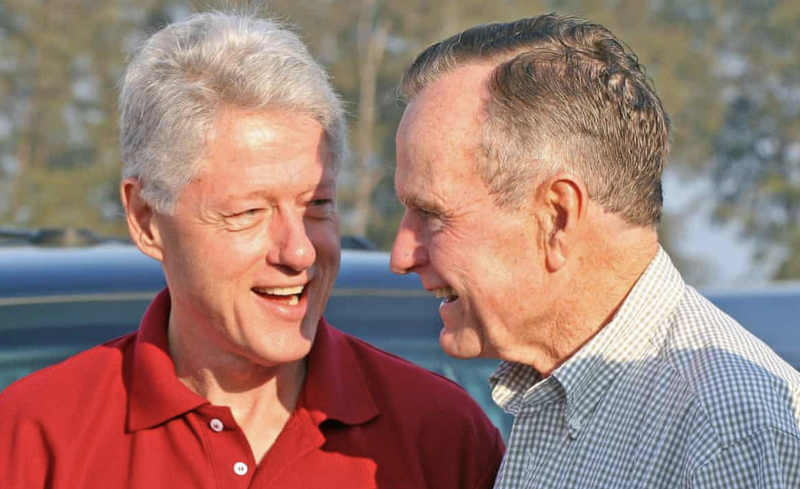 Similarly, George W. Bush once introduced Bill as his "brother from another mother." 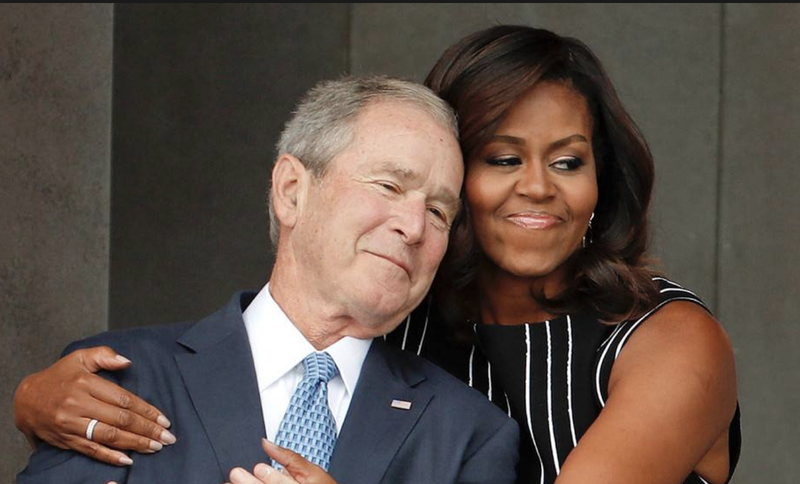 The warmth between the Obamas and the George W. Bushes has always been on display -- whether it's Michelle embracing W. or the Bush daughters reaching out to Sasha and Malia. The Kennedy and Bush families have been cordial for nearly 100 years now, dating back to the 1920s when Joseph P. Kennedy and Prescott Bush were amassing fortunes that would survive the Depression (and creating two of America's most influential dynasties). 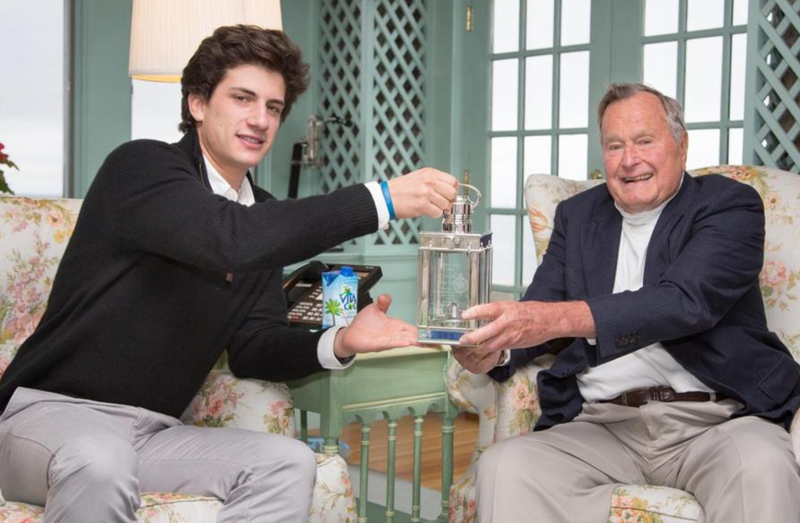 Here's JFK's grandson, Jack Schlossberg, with George H. W. Bush. So clearly the Bushes, Obamas and Clintons are all willing to leave political battles in the political arena. Donald Trump is the source of today's friction. •. He insists that the Clintons are guilty of treason and should be prosecuted. • He maintains that President Obama has gotten away with .... something. His blathering is a little hard to follow on this one. •. He recently mocked George H. W. Bush's "thousand points of light" ("what the hell is that?") and then had the chutzpah to laud it when eulogizing Bush. Politely put, our President is a jerk. It will be interesting to watch the grace with which he is treated by the Obamas, Clintons and Bushes next week when he finds himself seated among them in a pew at the National Cathedral. It will also be interesting to see 40% of the country refuse to give the Clintons and Obamas any credit whatsoever for decency and civility. For some reason, 40% of the country embraces Trump's inappropriate personal attacks. Much of the time his supporters insist Christ is their guide in this and all things, yet I am sure Jesus will be more favorably impressed by the Clintons and Obamas this week.